Historical significance: Known as the "Little Brown Cottage" this originally stood on the opposite side of Salem Street on the site of the Joseph Blunt House. The exact date and architect is unknown. In 1803 it was sold to William Hawley. It was bought by Job Abbott of Scotland District, for his daughter, Lucy Abbott, when she married Joseph Holt in 1835. Later, Joseph Holt built Blunt House and cottage, moving there and sold the "Little Brown Cottage" to Brainard Cummings. The house was moved across the street presumably by Joseph Holt when he built the present Joseph Blunt House. Brainard Cummings was a local contractor and carpenter. He sold to Mrs. Joanna Erving, who in turn sold to Ira A. Eastman. The 1880 census list Eastman, age 28, a Coachman, wife Nellie age 32, and two children, George E. age 6 and Lewis A. age 4. 1896 "Catalogue of Loan Collection" for 250th anniversary of Andover in "List of Old Houses and Sites" writes: " A very old house; formerly stood on opposite side of the street, sold to William Hawley in 1803. Reverent Dr. William Goodell, the famous missionary to Turkey for 40 years, lived here in 1811. Said by Bellows, the artist, to be the most picturesque house in Andover". The house was cut in half, when moved from corner of Woodland and Salem Streets across the street to this site. Half attached to Victorian then being built. This move may have been done by Ira Eastman as he had purchased the former Phillips District Schoolhouse on Highland Rd. on the site of Borden Gym at PA and moved it across the street. It was converted into a house. It was later purchased by PA and moved two more times. Now known as 1924 Alumni House. Augustus M. Davis and wife Rhoda purchased the house from Ira Eastman on Sept. 8, 1885. Augustus was born in Oct. 1837 in Compton, NH, son of Moses & Alice Compton. He moved to Lowell and married on Feb. 17, 1859 to Rhoda W. Parkhurst, b. Feb. 1836 in Tewksbury, MA, dau. of Joseph & Elizabeth Parkhurst. 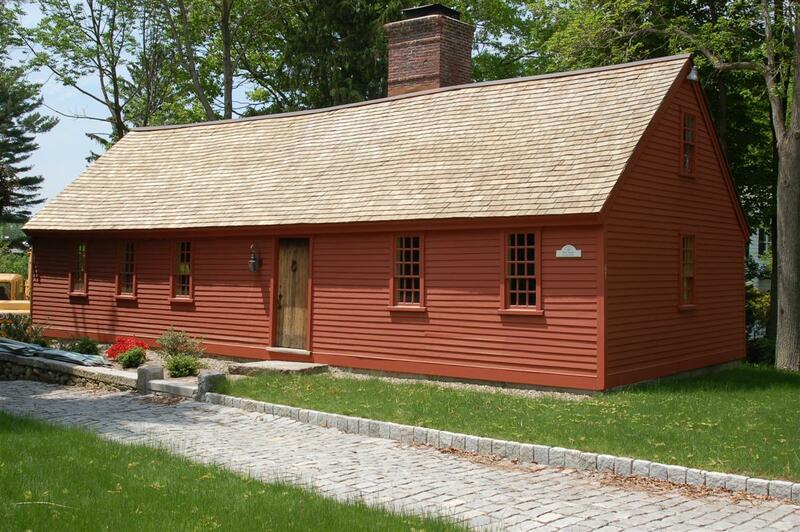 Augustus was a farmer at the time of his marriage, living in Billerica, MA, but was a house painter when in Andover. Augustus served in the Civil War Co. G 1 & L 1st Mass Calvary. He was listed a disabled and Rhoda filed for a pension after he died in 1925. Augustus & Rhoda had six children, five survived; Frederick A. b. Feb. 1861, lived with his parents, was a stone mason, died in1924. Frank A. b. 1864, a farmer, George E. b. 1866 - d. 1915, house painter, Ida M. b. 1871 - d 1960, married Healey, had one daughter Geraldine Healey b. 1895 - 1991 and Louis A. Davis b. Mar. 1872 - d. 1958, was a grocery salesman but then followed father's business as a house painter. All the children except Frank, remained with their parents. Ida and her daughter had also joined them by 1910. Even Rhoda's sister Matilda Parkhurst b. May 1858, a dressmaker, was living at the Davis house in 1900 Census. Augustus died on Jan 14, 1925 and wife Rhoda died on July 7, 1935. The Davis estate was administered by Clover J. Stone on Nov. 1, 1937. The Davis surviving heirs were Frank A. Davis, Louis A. Davis & Ida M. Healey. In the final years Louis M. Davis and Ida M. Healey held the property jointly until Louis died on Apr. 10, 1958. With the death of Ida M. Healey on Oct. 21, 1960, Geraldine Healey, Ida's daughter. then sold property to George & Ruth Sherwood on Mar. 13, 1961. The Davis family had occupied the home for 75 years. The Davis family are all interred at Tewksbury Cemetery. Retired architect, George Sherwood, bought it in 1961 and restored the home. Sherwood, who specialized in Colonial Revival in architecture re-built house, keeping old beams but replacing other old materials with new (reproductions). He had the architectural knowledge to truly restore and make the ancient dwelling livable and functional for today's life. An addition was placed on the west end of the house with and attached barn like structure housing two bedrooms and a bath. His wife Ruth Sherwood was a noted authority on antique furniture. George Sherwood died on Nov. 25, 1990 and Ruth placed the property into a Trust. When Ruth died in 2002 the property was sold to Linda Columbus on Mar. 11, 2003. Peter C. Jr. & Ellen S. Gundersen then purchased the house on June 26, 2003. Peter and Ellen began needed improvements to the interior of the house but a job relocation forced the Gundersens to sell their much loved antique home. On Jan. 8, 2007 the property was sold to Stoneington LLC. The new owners wanted more room and hired Thomas Childs to design a new addition to west end of the house. The Sherwood additions were razed in 2008 and a shingle style addition was built. The original main house was left intact except for all new cedar clapboard siding which was left natural. Historic Name Holt - Cummings - Davis House; "Little Brown cottage"